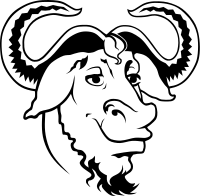 The GNAT Modified General Public License (short: Modified GPL, GMGPL) is a version of the GNU General Public License specifically modified for compiled units and for the generic feature found in the Ada programming language. The GNAT Ada compiler can automate conformance checks for some GPL software license issues via a compiler directive. Use pragma License (Modified_GPL); to activate the check against the Modified GPL. The GNAT Reference Manual  documents the License  pragma along with other compiler directives. ^ "GNAT Reference Manual". Retrieved 2010-07-21. ^ "Pragma License". Retrieved 2010-07-21. This page was last edited on 23 December 2018, at 23:40 (UTC).